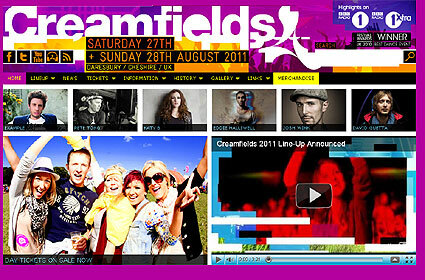 Creamfields is the award winning dance festival which takes place in Daresbury in Cheshire on August Bank holiday weekend. Across the 2 days the likes of Tiesto, Calvin Harris, Paul van Dyk, Ferry Corsten, Armin van Buuren, Above & Beyond and Gareth Emery will be performing at the event which has a capacity of 40,000 people each day. In 2010 the festival attracted record breaking numbers and sold out a month in advance. It was also awarded the Best Dance Event in the UK Festival Awards and voted Festival Of The Year in the Music Week Awards. Tickets are available via Ticketline, Ticketmaster, DontStayIn and Big Green Coach.